A clock is already ticking inside the mind of Robbie Muirhead. Season 2016/17 is just two weeks old, but the young forward cannot afford to waste time. His one-year contract at Hearts has ten months remaining. It is a tight window to maximise a big opportunity and earn the extension he craves. Muirhead acknowledges this is a second chance. A product of Kilmarnock’s youth academy, he admits a touch of laziness hindered him at previous club Dundee United, which led to a loan spell with Partick Thistle. He is determined not to repeat the mistake. At 20, he is very much unfulfilled potential. Whether he develops into a major player at Tynecastle depends on performances between now and next June. Other new arrivals like Connor Sammon, Bjorn Johnsen and Faycal Rherras were handed three-year deals by Hearts. Muirhead got 12 months. He isn’t complaining. The idea was to force him to go full throttle, to really showcase his ability and drive. He feels it’s already working and is challenging for a starting place against Inverness at Tynecastle tomorrow. He sits at a transformed Riccarton training complex overlooking the new indoor astroturf pitch, part of the new SFA performance centre opened in conjunction with Oriam Scotland. The facilities are space-age and Muirhead knows he is in a privileged position using them. In his first media interview since arriving in Edinburgh, he explained to the Evening News why he wants to change people’s perception of him. Having just a year to do so leaves little margin for error. “Say they offered me two years, then I take it easy in my first year and then think: ‘Oh, s**t. I need to try and get something else.’ The one-year deal is keeping my on my toes,” said Muirhead. “It stops me from relaxing. I think I’ve started off pretty well. I’ve only got a year and, as the gaffer told me, it all comes down to me at the end of the day. “I think I’d rather have it this way. When I signed at United I signed a three-and-a-half-year contract. I think I maybe did relax a bit. I haven’t done it intentionally but I knew in the back of my mind I still had another two seasons on my contract. A year’s contract doesn’t allow that. “I’ve learned not to take football lightly. I’ve learned it’s not as easy as I thought it would be. I need to go in every day and work as hard as I possibly can. I’m not saying I wasn’t working hard before, I’ve just learned not to take things for granted any more. A 45-yard “worldy” for Scotland Under-19s last year saw him nominated alongside Lionel Messi, Cristiano Ronaldo and Neymar for UEFA’s Goal of the Season. It offered evidence of his capabilities but at club level he didn’t do enough to impress following a £150,000 move from Rugby Park to Tannadice. Hearts chose to take a chance on pure potential when he became available in June. “It is a second chance. I said that to my agent,” admitted Muirhead. 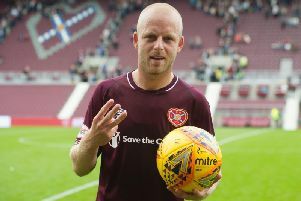 “I said if it didn’t work for me at Hearts then I’d probably need to go down the ladder and try to build my way back up again. Hearts and the gaffer have given me a chance to stay at a big club. It’s just up to me to make the most of the opportunity. “I had six months there when I wasn’t playing at all at Dundee United. I’m just starting to enjoy my football again. It’s a lot different here from where I’ve been before. I’ve been at Killie, Thistle and United but I feel there’s much better organisation here. That’s one of the main points. There has been no shortage of endeavour in a maroon shirt so far. Muirhead has made four competitive appearances and worked tirelessly to impose himself. Just don’t ask him what his best position is. “I don’t even know my best position,” he laughed. “When I was younger and Kris Boyd was at Kilmarnock, we’d play a 4-2-3-1 formation. I’d either be on the wing or in the No.10 position behind Kris. “I went to United and played six games in a row through the middle. I was playing well. Then I went to Thistle last year and I was playing right-wing. I’m obviously versatile but sometimes that doesn’t help you. I like to say I’m a centre-forward but I’ve probably played the majority of my games as a No.10 or out wide. It’s been mostly like that. “I got my first start for Hearts against St Johnstone last week in the League Cup. I thought I played okay, although the result wasn’t the best. I’ve come on as a sub against Celtic and Aberdeen in the two league games so far, so it’s not like I’m not getting played. “It’s definitely a lot better than the last six months of last season, when I was just in the stand and wasn’t even getting a place on the bench. I spoke to Mixu Paatelainen [then-Dundee United manager] at the end of the season. He said he couldn’t fault my effort or my attitude in training, I just wasn’t the type of player he was looking for.